$15 for General Admission, $5 for Students (any school), and will be available soon via the UVa Arts Box Office, on the Lawn, or at the door. Come ring in the holiday season with the Virginia Glee Club as we present our 78th Annual Christmas Concerts. Whether it’s our unique renditions of your holiday favorites or the Virginia Glee Club’s own traditional holiday pieces, such as the Biebl Ave Maria, there will be music to delight every ear. Concerts will be held, November 30th at Old Cabell Hall at 8:00 p.m. and December 8th at First Presbyterian Church at 8:00 p.m. Tickets are $15 for General Admission, $5 for students, and may be purchased online through the Arts Box Office, on the Lawn, or at the door. TICKETS are ON SALE NOW! 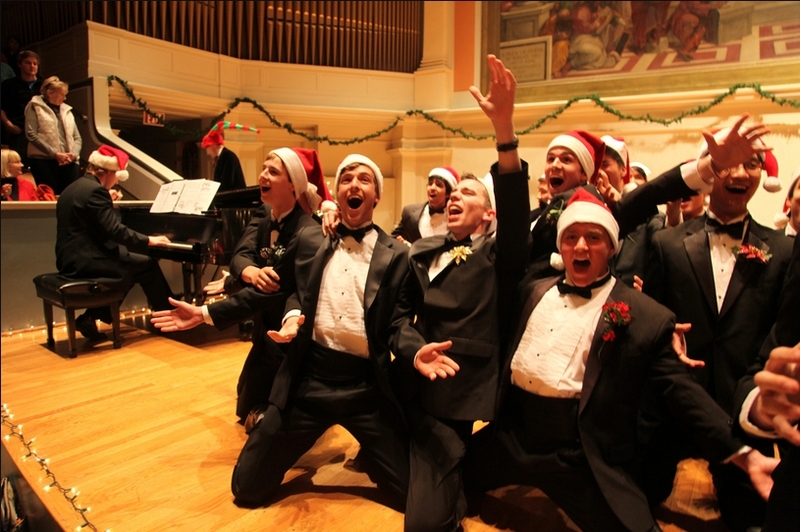 Christmas with the Glee Club incorporates both candlelight and comedy. Come join in the fun and celebrate the beauty of the holiday season. Be sure not to miss out on one of Charlottesville’s oldest and most joyful holiday traditions. Founded in 1871, the Virginia Glee Club is the oldest musical organization at the University of Virginia. The Club’s members, primarily undergraduate students, come from every school and college within the University. Members consider the group a “fraternity of talent,” committed to performing at a professional level, promoting fellowship, and preserving longstanding tradition. Throughout its history, the Virginia Glee Club has been consistently recognized as a leader among American men’s choruses, performing a variety of sacred and secular music in the classical tradition. The group performed for former President Bill Clinton at the national celebration of Thomas Jefferson’s 250th birthday and has also been heard on broadcasts of NBC’s Today Show, National Public Radio’s Performance Today, Virginia Public Radio, and the Voice of America. In addition to presenting on-grounds concerts, the group has toured widely, both domestically and abroad, and has collaborated with some of the finest women’s choruses in the eastern and southern United States. The Club toured France in the summer of 2000, visiting Paris, Lyon, Marseilles, Aix en Provence, Carcassonne, and Nice. More recently, in the spring of 2016, the Club went on a tour of Argentina, performing all over Buenos Aires, the largest province in the country. In the spring of 2017, the Club performed in Carnegie Hall as part of a concert honoring the legacy of Martin Luther King Jr. and toured the Southeast. In the spring of 2018, the Club premiered the first TTBB arrangement of the major work Dona Nobis Pacem by Ralph Vaughan Williams. The First Prebyterian Church is located at 523 Park Street. Paring is available in the adjacent lot.